With a frost settling in, everyone is scrambling to gather whatever tomatoes are left on the vines. Faced with a basket of lovely green orbs, here’s what I decided to make with them. Be sure the tomatoes are hard and show no signs of ripening or else they will turn to mush when cooked. Use a peeler to remove the skin from the tomatoes. Because they are green, the traditional method of blanching them in boiling water, shocking and then peeling does not work. 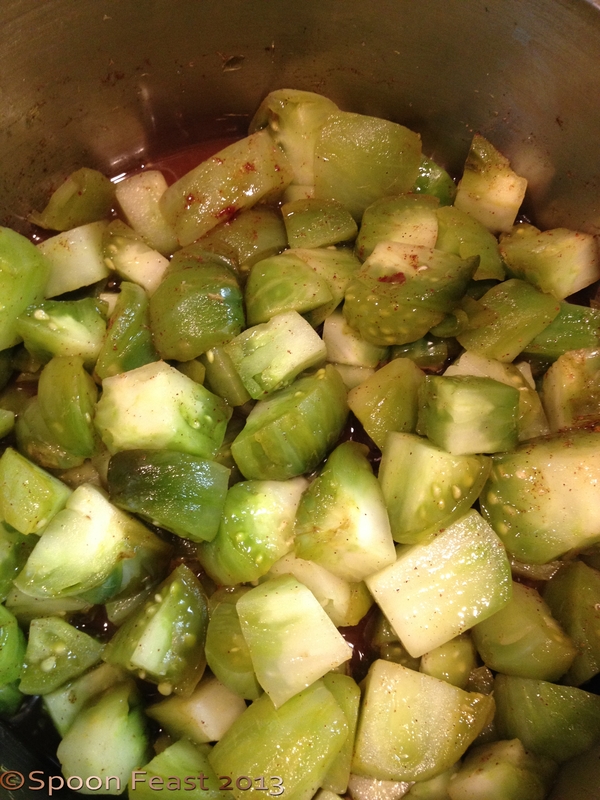 The green tomatoes are hard, like an apple, so peel them as you would apples. No need to remove seeds, as the seeds are hardly developed. Chop the tomatoes into bite sized pieces. Put them into a sauce pot with the lemon juice, lemon zest, and salt; bring to a simmer over low heat. You will notice a lot of juice being released by the tomatoes. Add the cinnamon, nutmeg and cloves. Stir this mixture often. When you see it come to a boil, add the sugar and simmer for 5-6 minutes. You want the tomatoes to become tender but not mushy. Add the butter and instant tapioca to the simmering tomato mixture, remove from heat and cool. The tapioca thickens the juices as it cools. You want the mixture to be cool when you put it into the pastry shell. While the tomato filling is cooling, make your pie dough, roll it out and line your pie tins or tart shells. If using already made (store-bought dough) prepare your pie pans. Pre-heat your oven to 435°F while you fill the pie shell. Fill the shells with the cooled tomato filling. Be sure to cut vents into the top crust. Seal the edges of the crust; brush the top with milk and sprinkle with sugar. I like to use raw sugar for the larger crystals. Bake in the pre-heated oven for 45 minutes or until the crust is golden brown and the filling is bubbly. You may need to add a foil shield around the crust edge to prevent it from getting too brown. Do this only after the edges are browned already, not when you first put the pie into the oven. 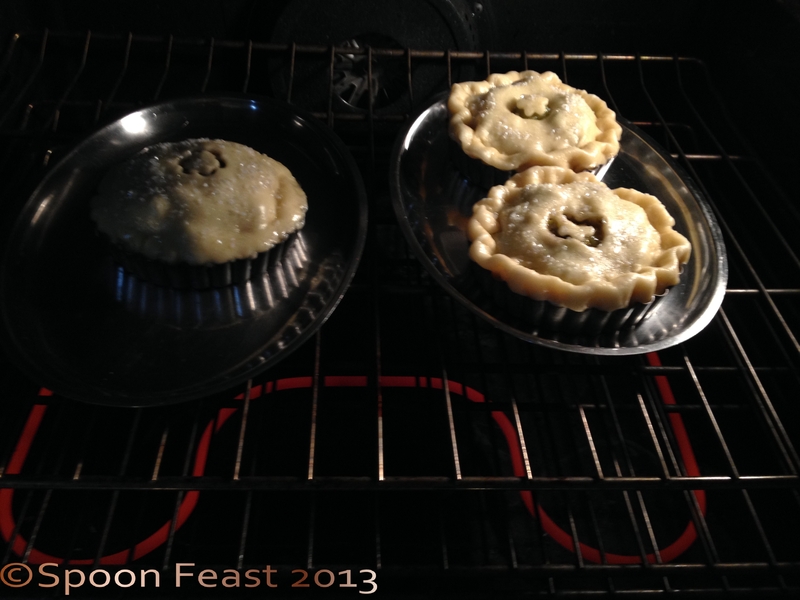 Additionally, place the pie on a sheet pan to catch any drips that may bubble out of the pie during baking. The sheet pan is easier to clean than the oven. Believe it or not, I couldn’t find a single solitary pie tin of any kind in my kitchen! I used to be a pie making queen. Where are they? All I could find is the fluted tart pans. So I had to use them and put a top crust on anyway. I tried a strusel topping but I didn’t care for the flavor combination with the filling. So I suggest you use a top crust. 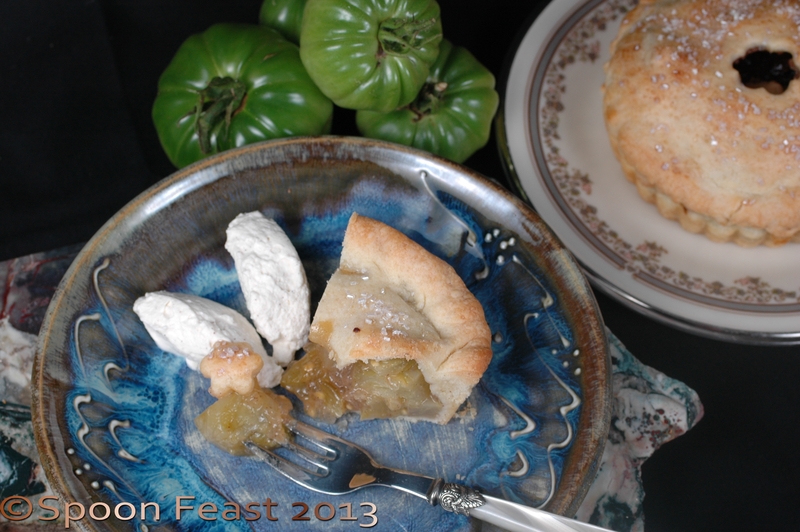 If you have a bunch of green tomatoes hanging around, try this pie. 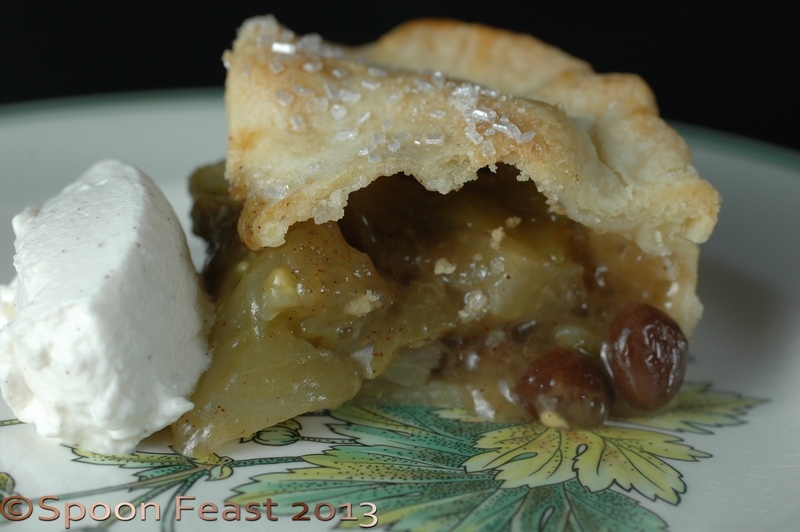 It tastes like apple pie made with Granny Smith Green Apples, the texture is the same too. Whip up some whipped cream, add a dash of cinnamon and serve. 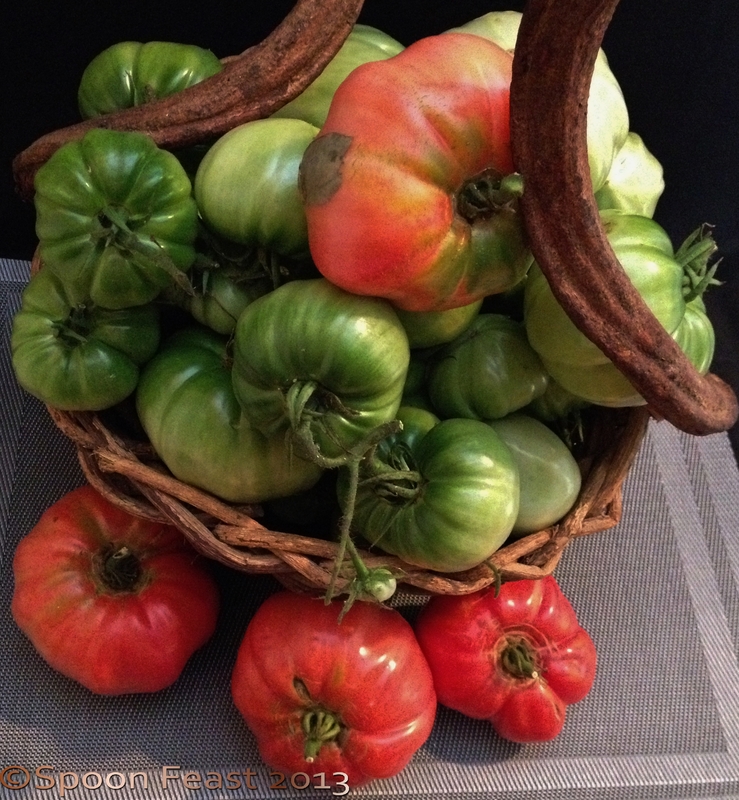 I still have a full basket of green tomatoes so next I’ll be making my Dad’s Green Tomato Chow Chow. Watch for the recipe! 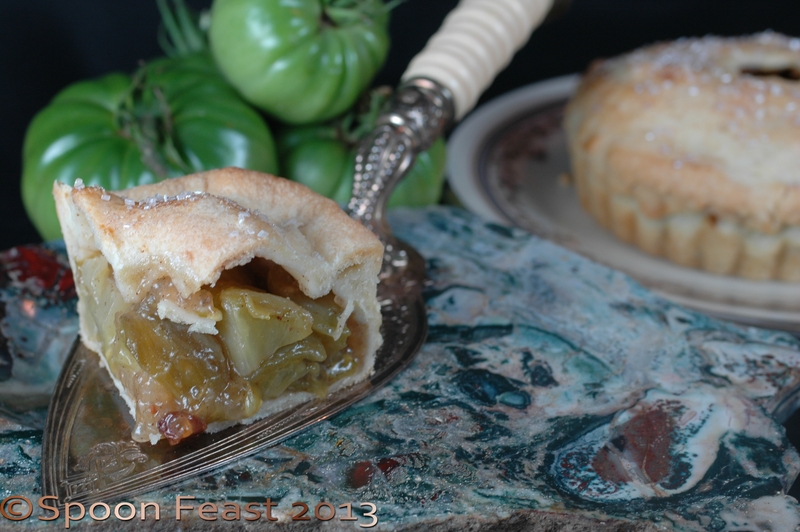 In the meantime, make a Green Tomato Pie. You’ll be pleasantly surprised! 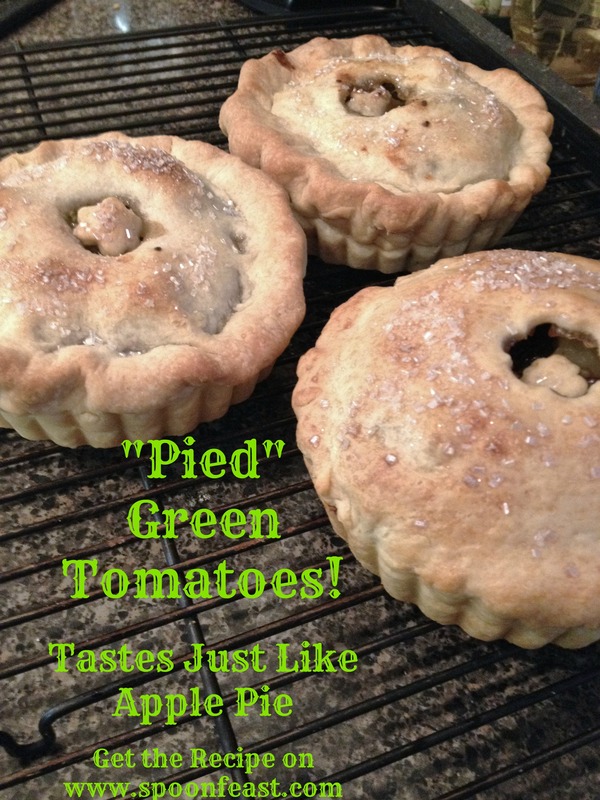 This entry was posted in Recipes and tagged Green Tomato, green tomato pie, green tomato recipes, green tomatoes, kosher salt, Pie, Sheet pan, Tablespoon, Teaspoon, Tomato. Bookmark the permalink. It is very good too! I hope you try it. Let me know what you think! I am going to try this on my family! Will post results! It’s fun and different, I hope you enjoy it!